Following the success of the In-App Purchasing API, we are pleased to introduce a new monetization option for app developers, the Amazon Mobile Ads API. Now, whether you monetize through paid apps, in-app purchases, or mobile advertising, Amazon offers a solution to help grow your business. 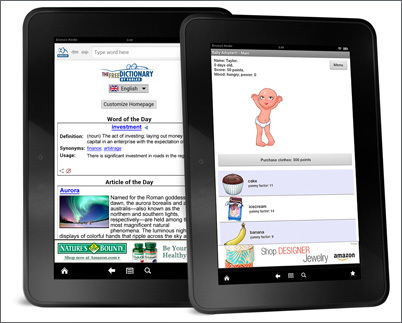 The Amazon Mobile Ads API serves ads to U.S. users, and works with mobile apps on Kindle Fire, Kindle Fire HD, and Android phones and tablets. Apps that use the Amazon Mobile Ads API may be distributed through any Android platform as long as they are available for download from Amazon as well. Developers who participated in the private beta program reported an increase in ad revenue, especially on their Kindle Fire optimized apps, after integrating with the Amazon Mobile Ads API. For more information on the Amazon Mobile Ads API, click here. We’ve also posted a short introduction video on our YouTube channel.